Glen Alpine School System Started? When was the Glen Alpine School System started and when was the first building built? This was the question I asked and we came up with a few answers. dated 1954, she states that “Robert Logan Patton…...in 1876 began teaching at Table Rock near his old home. After leaving there he taught at Boonville, The Globe, Amherst, Moravian Falls, Glen Alpine and Morganton. special district the Glen Alpine School. wanted better schools with longer terms, so in 1907 they voted to have a special school district. of the county was provided. written and researched by Eleanor Butler. These two above writings of history would match up on the dates and what happened, so I believe it to be true. The Patton School of Morganton closed when the first public high school was established in Glen Alpine in 1912.
teachers were available and the students could attend. 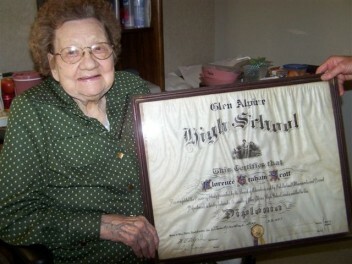 with her 1929 Glen Alpine High School Diploma. Aunt Florence turned 97 in September of 2007. So we know that the Glen Alpine School had graduating students in 1929.